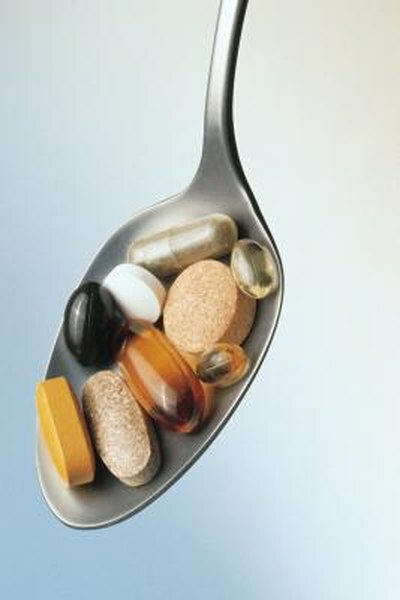 Vitamins and minerals can be weighed or measured in several increments, including micrograms, or mcg, milligrams, or mg, as well as international units, or IU. Since your body requires different amounts of each nutrient, be cautious of the type of unit of measurement for the recommended dosage versus the unit of measurement on the label; some vitamins or minerals are measured in both mg or mcg, as well as IU. International units, or IU, are not an exact weight, but rather a measure of the bioavailability of that particular nutrient, the Dietary Supplement Ingredient Database explains. Each international unit performs a specific biological effect that is universal as an international standard. Since international units vary based on the specific type of vitamin, there is not one established mathematical formula used to convert all IU into micrograms or milligrams. For example, 1 IU of vitamin E does not necessarily provide the same number of micrograms as 1 IU of vitamin A. Some supplement or food labels do the math for you, listing the vitamin in IU and the equivalent amount of micrograms or milligrams for that specific nutrient. The types of vitamins that are measured in IU come in a variety of forms and are highly active throughout your body. Vitamin E is a type of fat-soluble vitamin that acts as an antioxidant by fighting off free radicals that damage cells. Free radicals speed up the effects of aging and increase your risk of chronic diseases, such as cancer. Since each type has varying levels of bioavailability, each one is measured in different international units. For example, 1 IU of vitamin E is equivalent to 0.66 milligrams of delta-alpha-tocopherol or 1 milligram of alpha-tocopherol acetate. Alpha-tocopherol vitamin E is the one with the most bioavailability in humans and you need 22.4 IU of this form of vitamin E daily. Vitamin A makes up a group of compounds that play a role in reproduction, vision, bone growth and cell division. Carotenoids, beta-carotene, retinol, alpha-carotene and lutein are just a few of the compounds related to vitamin A. Your body absorbs vitamin A in the form of retinol most efficiently. Animal foods, such as beef liver, milk and eggs provide this form of vitamin A. Beta-carotene vitamin A from plant foods can be converted into retinol, but this process is not extremely efficient. Since the biological activity of each type of vitamin A compound varies, it is measured in retinol activity equivalents, or RAE, the Office of Dietary Supplements says. In supplements, 1 RAE is equivalent to 3.3 IU. To support normal functions, women need 2,310 IU of vitamin A daily. 1 IU of vitamin A is equal to 0.3 mcg of retinol or 0.6 mcg of beta carotene. Vitamin D is a unique vitamin since it can be made in your body when the skin is exposed to direct sunlight, but you also need to ingest it from foods or supplements. This important vitamin helps to keep your bones strong by aiding in the absorption of calcium. You need 600 IU of vitamin D as an adult, but after the age of 70 it increases to 800 IU. Biological equivalents, or 1 IU, of vitamin D can be converted to .025 micrograms of vitamin D in the form of cholecalciferol. OnlineConversion.com: How Do I Convert International Units (IU) Into Milligrams?